Melbourne make-up artist Nadia Peri was bullied on YouTube. AUSTRALIAN make-up artist Nadia Peri has revealed one of the worst comments she has ever received online after she was targeted by trolls over her looks. 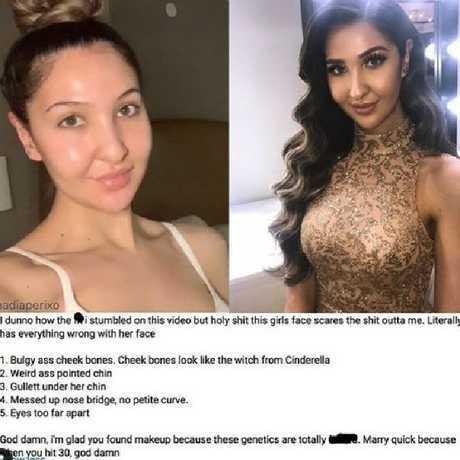 The Melbourne woman, who is also a YouTuber, recently posted a make-up tutorial on her channel when a stranger left her a "disgusting" comment, saying she has a "messed up nose", "eyes too far apart", "weird chin" and "bulgy a**e cheekbones". "Other than being told to die, this is probably one of the worst comments I've ever received online," Ms Peri said in an Instagram post alongside two images of herself, one with make-up and the other without. The viewer's comment read: "I dunno how the f**k I stumbled across this video but holy sh*t this girl's face scares the sh*t outta me." The troll then listed everything they thought was "wrong" with Ms Peri's face. 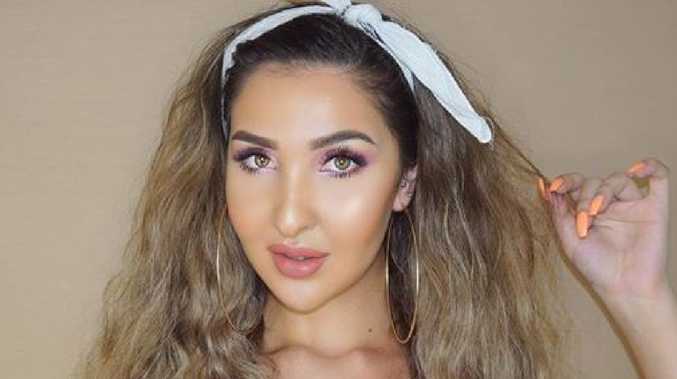 Melbourne make-up artist Nadia Peri shared this nasty comment she received from a troll underneath one of her make-up tutorial videos. Ms Peri said the comment was made a while ago but wanted to raise it with her followers to send the message that hateful comments are not OK, whether online or in person - and to shed light on online bullying. "I'm so over reading comments saying this is what you signed up for when I see people being bullied online (even celebrities)," Ms Peri said in her post. "No, it's not. It's that crappy mentality of victim blaming all over again. It's an excuse to allow bullies to continue getting away with their lousy behaviour online because they're unlikely to ever get away with it in person or at a job. "I'm sharing this because I want to remind you all that you're worth more than what people THINK and SAY about you, be it in person or online." The commenter also said Peri had a "gullet" under her chin, a "messed up nose bridge" and "no petite curve". Among the five-point list of ‘flaws’, the troll said her cheekbones looked like the witch from Cinderella. Ms Peri explained she got told she looked "scary/ugly without make-up sometimes" but still accepted herself with or without make-up. "I don't claim to be perfect, but I have a beautiful heart and I know that's what shines through," she said. Ms Peri told her more than 26,000 Instagram followers she was never hurt by the comment, and while she found it amusing, she also understood how "serious and disgusting" it was. "It shocks me that people like this actually exist," she said. She said the comment was as hurtful as the one she once received that told her to ‘kill herself’. Ms Peri shared the comments to her social media account to help shed light on online bullying. "There are people out there literally going out and getting surgery because of comments like this; the internet will point out flaws you never even knew you had. "I just wonder what happens when these kind of comments are left on people's posts that aren't as confident within themselves as I, and honestly it breaks my heart. "This is the kind of thing that can push someone who is already struggling with life over the edge." Ms Peri signed off her post by saying, "Next time someone tries to bring you down remember your worth and what you have to offer the world." Her followers were quick to jump to her defence and praise her raising the issue. "Just don't understand how people can be so cruel and heartless. I feel sorry for those people because they definitely aren't happy with their life. You're gorgeous babe," one woman wrote. "Don't listen to hurtful comments we live in a sick world and no one should ever try to bully anyone on social media I think you look absolutely amazing hun and am sure am not the only one as well there's absolutely nothing wrong with the way you are just rise above the negative comments and show them that they don't affect you," another added. Ms Peri says her goal online is to "bring happiness and laughter all round".